The way we work is changing, therefore the way we manage projects needs to change too. We see this mythical thing called leadership as being an extension of a new job title or as a line item in the role description. New thinking is absent, leading to stagnation of the team’s culture. Organisations may try to address point number one by sending the new incumbents on a leadership development course. However, in my experience, there is still very little focus on holding them accountable for the behaviour and communication changes that are needed to become the kind of leader who can inspire and motivate people to success. The value of any leadership training is only realised in its application and by seeking continuous feedback from the team. As Seth Godin said recently: knowing is one thing, acting on it is something else. Point number two is addressed differently. Often this lack of new thinking isn't evident until it's too late. Poor behaviours, loss of good employees, unproductive processes and failed projects are all signs that the project’s culture isn't set up to learn from its collective mistakes and to sustain future success. At this stage many organisations panic. They hire people with old-fashioned behaviours to 'rescue' the situation or - and we're seeing this a lot at the minute - they implement a method that they’ve heard works in the hope of getting immediate returns. Hello ‘agile’. The projects that succeed are led by people who understand the choices that they need to make in order to give good people the space to do great work. Whilst I’m seeing and hearing about a shift towards a bigger intent to focus on an emotional intelligence led approach, there are still those agencies and organisations trying to fix the problem with strategies that aren’t proven to work. Earlier this month, the NSW government announced its plan to banish IT project failures by implementing an EPMO (Enterprise Program Management Office). It will be responsible for establishing ‘sector-wide ICT portfolio, project and program monitoring and reporting to improve ICT investment outcomes and confidence in project delivery’. They must have missed the report from KPMG earlier this year which found that only 25% of PMOs were effective in supporting change. Good leadership would have seen this and not fallen into the same old trap. In his excellent book Creativity Inc., Pixar boss Ed Catmull said, ‘‘When it comes to inspiration, job titles and hierarchies are meaningless.” He’s right. What is inspirational, however, is seeing someone doing something that corrects a behaviour or addresses a mistake that’s been made before. Someone who learns a new skill or adopts a different mindset. Who flies in the face of convention and asks a different question. Who chooses not to create a new fiefdom but to challenge a poor behaviour. And who continually asks for feedback on what could be improved. 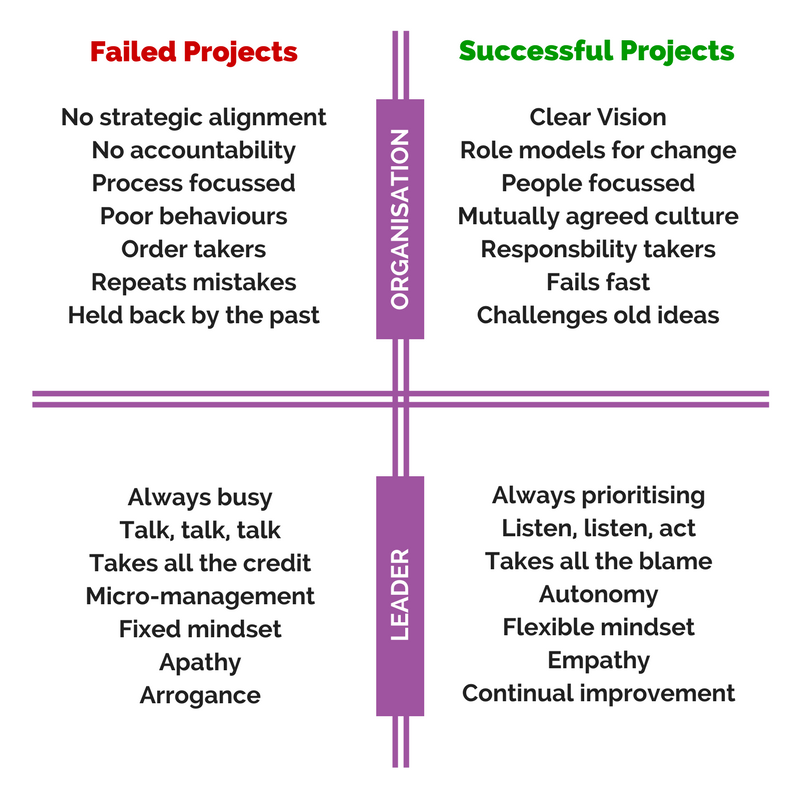 Leadership is a choice and we need more project people to make it, if we’re to stop the rot and start progressing.